He’s won a Grammy Award. He was inducted into the Rock and Roll Hall of Fame by Billy Joel, one of his biggest fans. He recently spent an enjoyable hour catching up with his old pal Keith Richards. 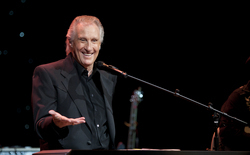 To call Bill Medley a legend is to watch a man cringe. “God, that sounds so old,” growns Medley, 70. But how else to describe a man whose soulful voice, along with the late Bobby Hatfield, provided the soundtrack for an entire generation that danced, kissed and got married to the Righteous Brothers’ music? But doesn’t he rely on email, Twitter, and FaceBook to stay connected with friends and fans? In an era when a star is made in one season of “American Idol”—or one video on YouTube—it’s easy to forget the slower, more old-fashioned route to stardom. For Medley, the journey began in California. Born in Los Angeles in 1940 and raised in Santa Ana, Medley grew up with music. His father led a big band and played saxophone. His mother sang and played piano. Medley taught himself to play piano. He also sang in glee club and amateur singing contests as a child. But everything changed the day he heard the music of Ray Charles. They found their name at the end of a 1962 performance in Los Angeles when a Marine in the audience shouted, “That was righteous, brothers!” And indeed, it was. From there time began to move faster for Medley and Hatfield, who toured with the Beatles and the Rolling Stones. Medley hung out with Elvis and played the lounge at the legendary Sands hotel in Las Vegas when Frank Sinatra had the main room. Sinatra. Elvis. The Beatles. It’s not hard to see why Springfield businessman Randy Little and his partners wanted to book Medley at the Starlite Theatre in Branson. In 2005 a 64-year-old Medley arrived in Branson, Missouri, a town known to many as a destination for country music fan and bus tours. But as the first baby boomers turn 65 in 2010, Medley believes the time is right for rock and roll artists to play Branson. Hence, those grandchildren. And Medley’s daughter, 23-year-old McKenna Medley, has a singing voice that improbably but beautifully complements her father’s in the old Righteous Brothers’ numbers. The Righteous Brother has become a Righteous Father—and a grandfather. Medley and his current wife, Paula, a Michigan native, divide their time between Newport Beach, Calif., and a 5,000-square foot stone and timber lodge set on 20 acres in Branson, just minutes from the Starlite Theatre. When he’s not performing, Medley spends his time sitting on his deck, playing the piano (“I call it my shrink,’” he says), and enjoying time with friends and family. But when friends include people like Michael Grimm, winner of “America’s Got Talent,” the line between work and play can blur as evidenced by the concert film Medley’s working on that will showcase the talent of Grimm and others. And of course like any true performer, Medley is always preparing for his next show. The surprise hit of Medley’s 2010 show has been the Unplugged storytelling segment during the second half of the show. That’s when Medley, along with daughter McKenna and their band, move out from behind their instruments and staging to get up close and personal with the audience with a set of songs and stories that seem like a cross between MTV's Unplugged and VH1’s Behind the Music. Where else can you hear the insider stories about how Blue-Eyed Soul music came to be? It’s like a Rock and Roll history lesson taught by the man who actually lived it. And if the 70-year-old rocker ever starts to get tired after singing “Rock and Roll Heaven,” “Unchained Melody, “Time of My Life,” “(You’re My) Soul and Inspiration” and “(You’ve Lost) That Lovin’ Feelin’,” six days a week, he needs only to look out and see the faces in the audience.